So yeah its been a hot summer, all the weddings we have attended have been bathed in sunshine and guests have loved spending time in the basking in the sun with a few alfresco drinks. The extra heat can change the dynamic of a wedding venue, maybe when couples where planning many months ago they dreamed of sunshine but now its a reality they find that the venues internal spaces are hardly been used and instead the outdoor areas are been optimised by guests until late in the evening. The flexibility of Hashtag Printing makes it the perfect addition, guests can still take pictures outdoors with their phones and upload them to Instagram or Twitter and a few seconds later their picture will be printed as a stunning keepsake. Any product that required them to be inside the venue such as a traditional photobooth or magic mirror would hardly be used by guests. Our product ensures the amazing sunshine isn’t a problem for your photo option for guests and you get the best value for money. 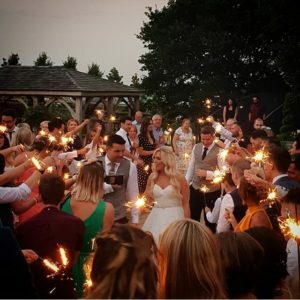 One further advantage is that subject to an electrical connection our whole setup can be moved outdoors to give your wedding an extra special summer vibe! We have operated outdoors at a number of recent events and not only do the guests love it but so do our Hashtag Printing assistants!